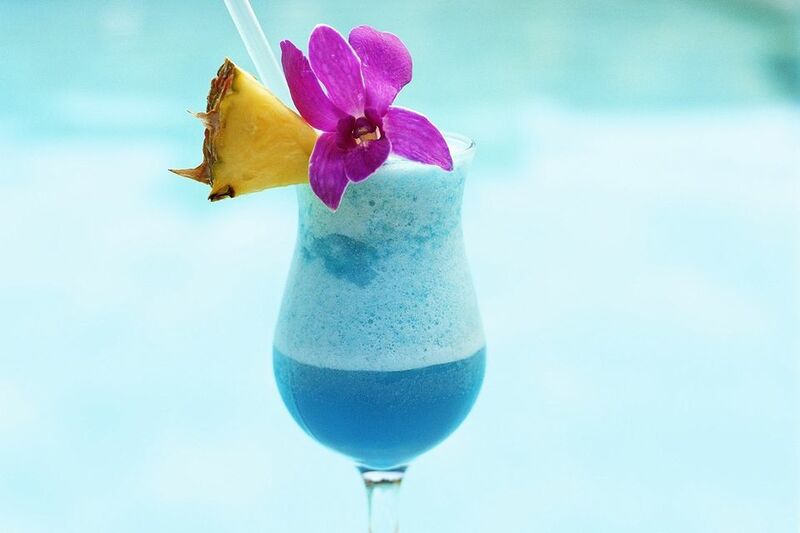 The chi-chi is a favorite frozen cocktail that has a beautiful ocean blue color and familiar tropical taste. It offers something a little different than the average margarita and daiquiri, and is sure to add a splash of fun to your summer! Filled with pineapple and coconut flavors, the chi-chi is like a blue version of the piña colada with a vodka twist. It has all the same flavors, they're just dressed up in a different package. The stunning blue color comes from blue curaçao, the most reliable liquor in the bar to get that color. It's also a little creamier than most frozen cocktails because it uses both cream of coconut and vanilla ice cream. Take this one poolside or just sick back and relax with it in the backyard! Either way, it's a perfect treat for a hot summer day. Pour into a chilled margarita or highball glass. Garnish with a pineapple wedge or slice. If the mix turns out too thick add a little more cream of coconut, vodka, or blue curaçao and blend again. When it's too thin for your taste, add ice or ice cream. Canned pineapple is a good option if you don't have the fresh fruit around. Be sure to drain the juice, but you might want to keep it in reserve in case the drink needs to be thinned. With blended cocktails, you'll find it best to use crushed ice to get a smooth consistency. If you only have ice cubes, add those to the blender on their own and chop them up before adding the rest of the ingredients. Try the chi-chi with a coconut vodka instead. It adds a brightness that really ramps up that flavor in the drink. For a budget-friendly option, look for New Amsterdam Coconut. Ciroc Coconut Vodka is one of the best available in this flavor, though it is a little pricier. There are many more possibilities for flavored vodkas that you might want to try as well. Mix a chi-chi up with raspberry, citrus, or one of the whipped cream vodkas for an extra layer of flavor. How Strong Is a Chi-Chi? It's more difficult to estimate the alcohol content of blended drinks than it is regular cocktails because there are so many factors involved. The amount of ice, ice cream, and fruit you add will affect the drink's final strength. Yet, on average, you can expect the chi-chi to weigh in around 9 percent ABV (18 proof) when made with 80-proof vodka. That's a perfectly relaxing strength that won't leave you tipsy after the first round.